When Pakistan emerged as an independent state in 1947, it sought to provide a new homeland and safe harbor for South Asia’s Muslims, the largest religious minority in the subcontinent at the time. Yet this project was not exclusive. Taking its name from Pakstan, an acronym composed of the key letters of its constituent regions-Punjab, Afghania, Kashmir, Sindh, and Baluchistan-Pakistan at first welcomed all of its new citizens, Muslim and non-Muslim alike. Non-Muslims comprised 23 percent of the total population, and non-Sunnis comprised a quarter of the Muslim population. In Purifying the Land of the Pure, Farahnaz Ispahani analyzes Pakistan’s policies towards its religious minority populations, beginning from the time of independence in 1947. She notes the period of transition from an inclusive policy to an exclusive one, citing the influence of a number of religious and political leaders who invoked a new vision for Pakistan. The word “pakistan” is Urdu for “Land of the Pure”; thus, in their view, it followed that the objective for Pakistan’s creation should be more specific and narrow: to create an Islamic State. In 1949, Pakistan’s Constituent Assembly ratified this objective, which set the country on the path it was to follow. But as Ispahani carefully notes, the event that accelerated the pace towards intolerance of non-Sunnis was General Zia-ul-Haq’s forceful ascent to power in 1977. His military regime promoted Sunni Islam at the expense of other denominations so that by the end of his reign, Pakistan was no longer a welcome place for minorities. Many fled, but those who remained faced escalating persecution, from both state and non-state actors. Tens of thousands died in the ensuing “purifying” attacks. Ispahani traces this history, stressing how the contradictions at the heart of the Pakistani state-building project have fueled the intolerance. Over time the Pakistani state has moved from accommodating the Ahmadiyya community as full citizens of the state to forcibly declaring them non-Muslim and eventually criminalizing them for their religious beliefs. Politics of Desecularization deploys the ‘Ahmadi question’ to theorize a core feature of modern public Islam – its contested and unsettled relationship with the nation-state form. It posits that our current understandings of modern religious change have been shaped by a highly limited number of national cases in which states have been successful at arriving at stable ideologies about religion. Pakistan, however, epitomizes polities that are undergoing protracted political and cultural struggles over religion’s proper place in the state. The book’s gripping account shows that these struggles are carried out in social sites as diverse as courts, legislative assemblies, and newspapers. The result in Pakistan has been the emergence of a trajectory of desecularization characterized by official religious nationalism. The Shias of Pakistan are the world’s second largest Shia community after that of Iran, but comprise only 10-15 per cent of Pakistan’s population. In recent decades Sunni extremists have increasingly targeted them with hate propaganda and terrorism, yet paradoxically Shias have always been fully integrated into all sections of political, professional and social life without suffering any discrimination. In mainstream politics, the Shia- Sunni divide has never been an issue in Pakistan. Shia politicians in Pakistan have usually downplayed their religious beliefs, but there have always been individuals and groups who emphasised their Shia identity, and who zealously campaigned for equal rights for the Shias wherever and whenever they perceived these to be threatened. Shia ‘ulama’ have been at the forefront of communal activism in Pakistan since 1949, but Shia laymen also participated in such organisations, as they had in pre-partition India. Based mainly on Urdu sources, Rieck’s book examines, first, the history of Pakistan’s Shias, including their communal organisations, the growth of the Shia ‘ulama’ class, of religious schools and rivalry between ” and popular preachers; second, the outcome of lobbying of successive Pakistan governments by Shia organisations; and third, the Shia-Sunni conflict, which is increasingly virulent due to the state’s failure to combat Sunni extremism. 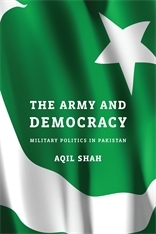 This month, Harvard University Press publishes The Army and Democracy: Military Politics in Pakistan by Aqil Shah (Princeton University). The publisher’s description follows. Since Pakistan gained independence in 1947, only once has an elected government completed its tenure and peacefully transferred power to another elected government. In sharp contrast to neighboring India, the Muslim nation has been ruled by its military for over three decades. Even when they were not directly in control of the government, the armed forces maintained a firm grip on national politics. How the military became Pakistan’s foremost power elite and what its unchecked authority means for the future of this nuclear-armed nation are among the crucial questions Aqil Shah takes up in The Army and Democracy. Pakistan’s and India’s armies inherited their organization, training, and doctrines from their British predecessor, along with an ethic that regarded politics as outside the military domain. But Pakistan’s weak national solidarity, exacerbated by a mentality that saw war with India looming around every corner, empowered the military to take national security and ultimately government into its own hands. As the military’s habit of disrupting the natural course of politics gained strength over time, it arrested the development of democratic institutions. Based on archival materials, internal military documents, and over 100 interviews with politicians, civil servants, and Pakistani officers, including four service chiefs and three heads of the clandestine Inter-Services Intelligence, The Army and Democracy provides insight into the military’s contentious relationship with Pakistan’s civilian government. Shah identifies steps for reforming Pakistan’s armed forces and reducing its interference in politics, and sees lessons for fragile democracies striving to bring the military under civilian control. Next month, the University of Chicago Press will publish Secularizing Islamists? : Jama’at-e-Islami and Jama’at-ud-Da’wa in Urban Pakistan by Humeira Iqtidar (Kings College London). The publisher’s description follows. Secularizing Islamists? provides an in-depth analysis of two Islamist parties in Pakistan, the highly influential Jama‘at-e-Islami and the more militant Jama‘at-ud-Da‘wa, widely blamed for the November 2008 terrorist attack in Mumbai, India. Basing her findings on thirteen months of ethnographic work with the two parties in Lahore, Humeira Iqtidar proposes that these Islamists are involuntarily facilitating secularization within Muslim societies, even as they vehemently oppose secularism. This book offers a fine-grained account of the workings of both parties that challenges received ideas about the relationship between the ideology of secularism and the processes of secularization. Iqtidar particularly illuminates the impact of women on Pakistani Islamism, while arguing that these Islamist groups are inadvertently supporting secularization by forcing a critical engagement with the place of religion in public and private life. She highlights the role that competition among Islamists and the focus on the state as the center of their activity plays in assisting secularization. The result is a significant contribution to our understanding of emerging trends in Muslim politics. 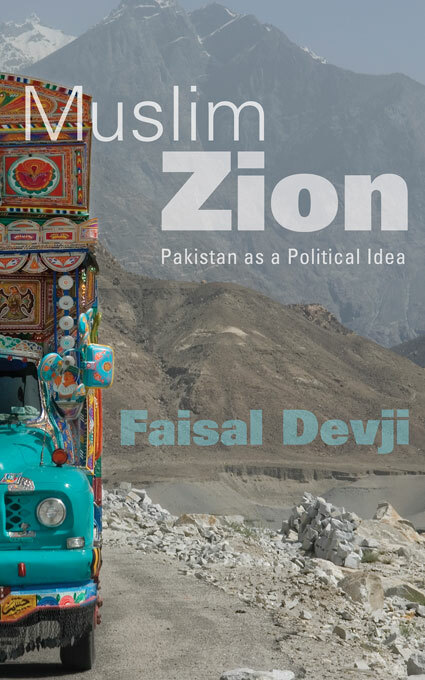 In August, Harvard University Press will publish Muslim Zion: Pakistan as a Political Idea by Faisal Devji (Univ. of Oxford). The publisher’s description follows. Pakistan, founded less than a decade after a homeland for India’s Muslims was proposed, is both the embodiment of national ambitions fulfilled and, in the eyes of many observers, a failed state. Muslim Zion cuts to the core of the geopolitical paradoxes entangling Pakistan to argue that India’s rival has never been a nation-state in the conventional sense. Pakistan is instead a distinct type of political geography, ungrounded in the historic connections of lands and peoples, whose context is provided by the settler states of the New World but whose closest ideological parallel is the state of Israel. A year before the 1948 establishment of Israel, Pakistan was founded on a philosophy that accords with Zionism in surprising ways. Faisal Devji understands Zion as a political form rather than a holy land, one that rejects hereditary linkages between ethnicity and soil in favor of membership based on nothing but an idea of belonging. Like Israel, Pakistan came into being through the migration of a minority population, inhabiting a vast subcontinent, who abandoned old lands in which they feared persecution to settle in a new homeland. Just as Israel is the world’s sole Jewish state, Pakistan is the only country to be established in the name of Islam. The Reconstruction of Religious Thought in Islam (1930) is Muhammad Iqbal’s major philosophic work: a series of profound reflections on the perennial conflict among science, religion, and philosophy, culminating in new visions of the unity of human knowledge, of the human spirit, and of God. Iqbal’s thought contributed significantly to the establishment of Pakistan, to the religious and political ideals of the Iranian Revolution, and to the survival of Muslim identity in parts of the former USSR. It now serves as new bridge between East and West and between Islam and the other Religions of the Book. With a new Introduction by Javed Majeed, this edition of The Reconstruction opens the teachings of Iqbal to the modern, Western reader. It will be essential reading for all those interested in Islamic intellectual history, the renewal of Islam in the modern world, and political theory of Islam’s relationship to the West. This July, the University of Texas Press will publish Pakistan’s Blasphemy Laws: From Islamic Empires to the Taliban by Shemeem Burney Abbas (SUNY Purchase). The publisher’s description follows.